It is understandable that Pope Francis has misgivings about market economies, given that his formative experience comes from his native Argentina, which has been governed horribly and has much widespread corruption and poverty. It is unfortunate that he seems to have absorbed the Marxist critique of capitalism that is embedded in the Liberation Theology endemic to much of Latin America. It is a tragedy for the poor that he apparently has never read, or does not accept, the wisdom of Peruvian economist and hero Hernando de Soto in his book The Mystery of Capital. I pray that Francis will seek de Soto’s counsel. In his revelatory book, de Soto sees the primary problem for the poor throughout the developing world as the fact that most of them are excluded from the formal, legal economy and must operate in the shadows of the informal economy. Thus, the extension of property rights to the poor in the form of having title to their homes and property is seen as the beginning of the extension of capital, credit, and legitimacy that will unlock their creativity and productivity, leading to prosperity for all. This soft infrastructure of the rule of law is what the Third World lacks that developed countries do not. Thus, capitalism is not the problem, it is the lack of a completely inclusive capitalism in the Third World that causes such widespread poverty even with supposed market economies. There is some evidence that human activity may contribute to a slight warming of the Earth’s average temperature, all else held equal. But the histrionic claims of widespread death, disease, and destruction in 100 years unless massive taxes on carbon or other means of dramatically raising the cost of energy are enacted are farcical. There is no scientific basis for such claims. And the guaranteed result would be much greater suffering for the world’s poor. Remember that a computer model run is not a test of a scientific hypothesis. In fact, climate change seems to be an untestable and unfalsifiable hypothesis, because any predictions made now will not be tested for 100 years, conveniently after today’s climate scientists have collected their salaries and other largesse, and have passed to the great beyond. We should return to first scientific principles, and the scientific method a la Karl Popper. If gigantic costs are to be imposed on society based on a scientific hypothesis, then the burden of proof should be very high. Cost-benefit analysis and a rational search for lowest-cost solutions should be the next step, rather than attempting to lower the standard of living for all to something like that of 1850 out of a moralizing desire to impose a painful penance on humanity. Even if the disaster scenario is true, the way to approach the problem is as an engineering problem. Impoverishing people today for a slight postponement of disaster a century from now is a sadistic gesture, not a sensible program for change. Much more sensible are the suggestions of Bjorn Lomborg to invest in technology (such as solar power improvements) that can solve the problem out of abundance rather than austerity and poverty. This is the way to actually help the poor. This video interview of Nick Gogerty by Jake Taylor is a great introduction to some of the important ideas in Gogerty’s book The Nature of Value. Looking at value in this way will lead us to be better investors in businesses, and not simply traders of tickers. This is really a fascinating and wide-ranging interview. 1. The economy is an evolutionary, adaptive system that selects and evolves for greater and greater value creation over time. 2. Value is important because it is closer to economic truth than price. 3. Value is a process and not just a static entity. 4. Experience curve effects are one of the main mechanisms for increasing efficiency and value creation in a company, a cluster, and an economy. 5. Identifying companies with sustainable economic moats is key to the nature of value approach to investing. This requires us to understand the dynamics of the business, as well as, how the business interacts with other companies within its cluster to compete and create value. 6. Clusters exhibit periods of “punctuated equilibrium” that last for a period of time, and are followed by periods of upheaval, and eventually a new temporary equilibrium. 7. Key to investing well is choosing companies in stable clusters with a slow rate of change in strategy and capabilities. This would include the Lollapalooza and Cash Cow clusters. Companies in innovative clusters with fast rates of change in products and capabilities are many times not great places to invest, such as with the internet boom at the turn of the century. A lot of value was created, but most of it flowed to customers, and not to companies within the cluster. This is a key insight, and is worth the price of the book to me. 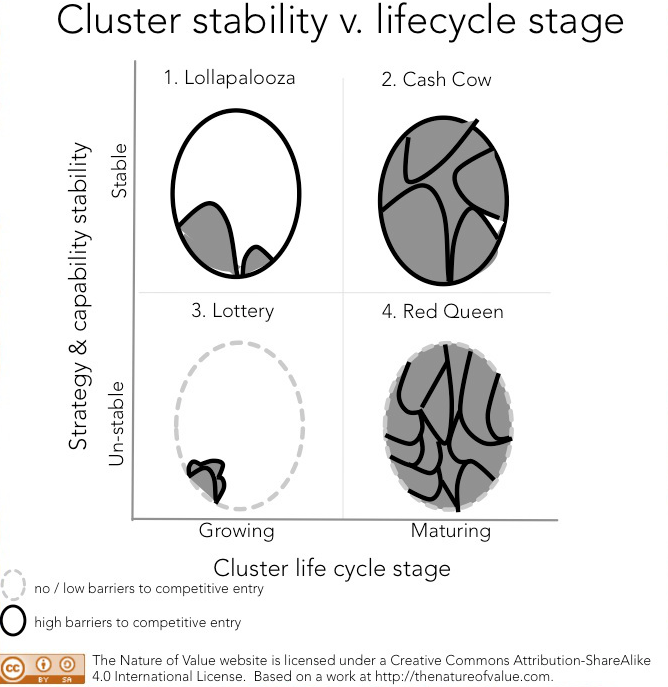 The following chart shows the matrix of cluster types according to cluster stability and life cycle stage. 8. Return on capital is more important to value creation than absolute growth in revenue and profits at lower rates of return. If additional capital can only be deployed at lower and lower rates of return, capital should be returned to shareholders so they can allocate it to higher return areas. Otherwise, value is destroyed. Soft infrastructure like property rights and the rule of law are key for prosperity and the nature of value approach to work. The lack of these is the main reason for the appalling human suffering in much of Africa. The best anti-poverty program in the world is to create such soft infrastructure. This explains why years of foreign aid to Third World countries has had little positive impact as corrupt elites embezzle aid and stifle the value creating capacities of the common people. Thus, the nature of value approach is really a moral and human imperative, and not simply a device to make money for yourself. Gogerty’s approach highlights a blind spot of many Keynesians who suggest that companies should just throw more money at plant and equipment and invest for growth. This mechanistic, aggregationist approach, which seeks to reduce economics to arithmetic formulas where more inputs equals more outputs, ignores the true evolutionary nature of an economy. Rather, return on capital is crucial for value creation, which leads to success for companies and economies, as well as, overall societal well-being. Capital discipline, and not growth at any cost, should be the aim for CEOs and allocators. Otherwise, value will be destroyed and well-being will decrease.